If there was one country I was most excited about visiting during my trip it was Vietnam, after 3 different friends of mine told me it was their favourite place in Southeast Asia. In Vietnam, it’s popular with tourists and backpackers to explore the country by motorbike on the Ho Chi Minh trail, which runs all the way from North to South (and vice versa). Me and Edd were both keen to buy a bike and see for ourselves what all the fuss was about! I met Edd in Hanoi after a tiresome 35 hour journey from Vang Vieng on a cramped sleeper bus. I’d heard a lot about the crazy traffic in Hanoi and found that the city certainly lived up to the rumours as I was greeted by a sea of noisy motorbikes. As crazy as the city seemed at first, we soon discovered that Hanoi has some beautiful spots where you can escape from the hustle and bustle. This includes the Hoàn Kiêm Lake, where you can visit the Ngoc Son Temple, also known as the Temple of the Jade Mountain, situated on a small island in the middle of the lake. 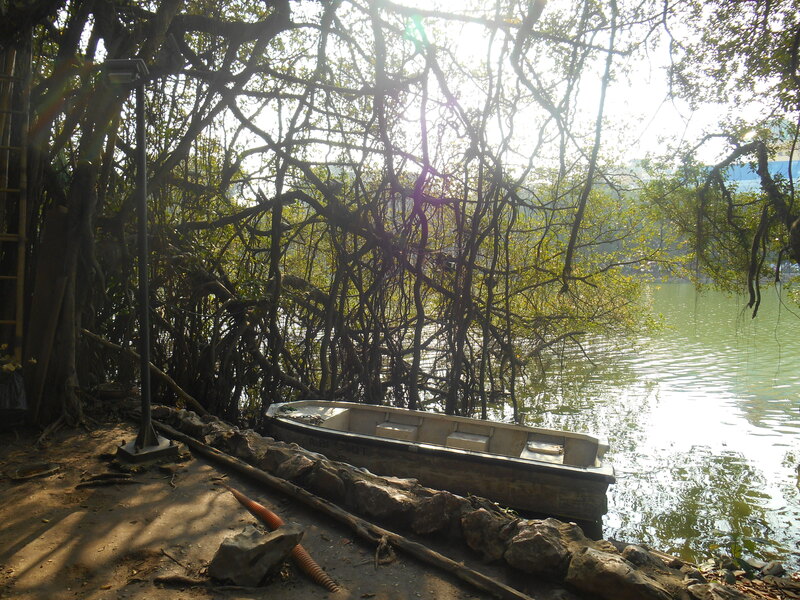 This has to be one of my favourite temples yet, as it’s surrounded by trees protruding out the lake. Other areas of interest include the Temple of Literature, which feels like a very traditional Vietnamese temple, and the Hoa Lo Prison Museum, which gives you a very interesting and informative insight into the history of Vietnamese independence. As you wander around the prison cells and lay your eyes on the still in-tact guillotine, you get an eerie feel for what the prison would have been like for the unlucky prisoners who were trapped there. After a busy couple of days exploring the attractions Hanoi had to offer, especially the harrowing prison, we were keen to sample the Vietnamese beer to see if it could compete with Laos. While Hanoi is not short of bars, we found ourselves returning every night to the same spot along with a group of travellers we met on the first night. Many locals brew their own beer, which they serve from the side of the street out of a big keg for around 15p a glass. For such a cheap price, we couldn’t even think of drinking anywhere else! Before coming to Vietnam, I’d been told by some girls I met in Thailand that I absolutely had to try the infamous Vietnamese egg coffees. While this sounded like an extremely odd concoction to me (especially as I don’t like coffee), Edd was determined to give one a try. 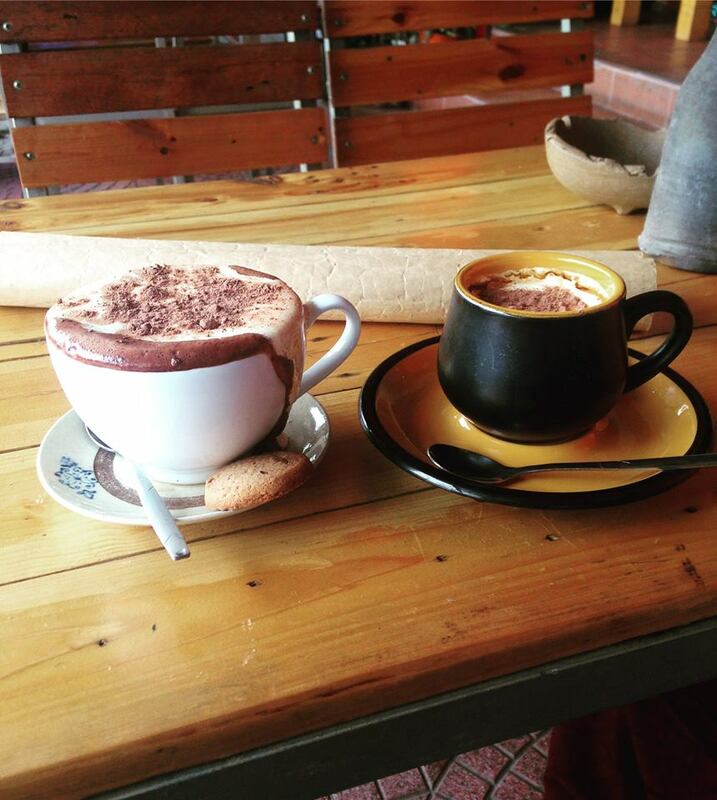 To my delight, the place we found also served egg hot chocolate, so we gave both a try. And that was it – we were hooked! I’d already seen wonderful pictures of Halong Bay and its dozens of islands, so I was excited to get out of the city and onto a boat to Cat Ba Island. However, when we arrived in Cat Ba we found ourselves wrapping up in all our layers as the weather temperature dropped for the first time on our trip. 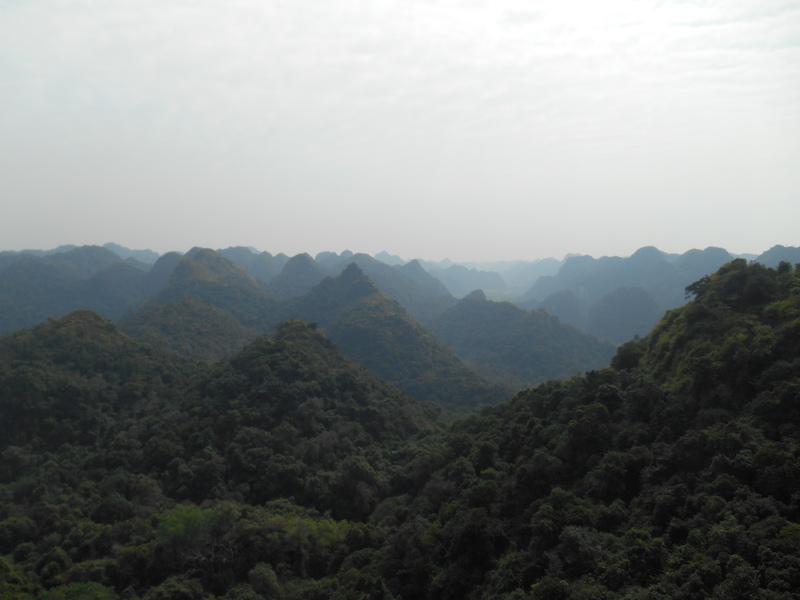 On Cat Ba, the main tourist attraction is the big national park, which can be reached easily by motorbike. So we spent a day trekking in the national park, which offered the most amazing views of the mountains, before finishing off with a visit to Hospital Cave. As Cat Ba is such a small place, I decided to have a go on the automatic scooter we’d rented to see if I could handle driving one from Hanoi to Ho Chi Minh. After nearly crashing the bike in a ditch, it was safe to say that I was sticking to the back of the bike for the rest of the trip! We finished our last day in Cat Ba on one of the 3 quiet beaches on the islands. I was happy to finally see the sea! We booked a slow boat to Halong Bay so we could admire the spectacular views of the many islands protruding out of the sea. Luckily, the sun decided to re-emerge, and we were thrilled to roll our trousers up and enjoy the rays on the boat’s top deck. Back in Hanoi, we bought an automated scooter from a couple who were also backpacking through Southeast Asia. They’d already driven the Ho Chi Minh trail but in the opposite direction to us. 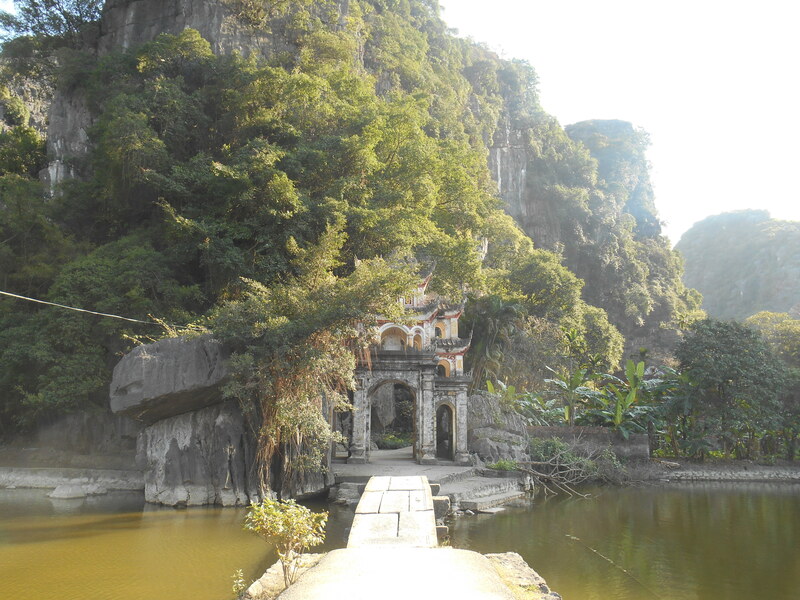 Then, we were off to our first stop on the Ho Chi Minh trail – Ninh Binh! After having trouble driving our way out of Hanoi (including driving on a car only road), we welcomed the peacefulness and serenity of Ninh Binh. Already, we could see why it’s so popular to travel Vietnam by bike as we swerved our way through the paddy fields. We had a quick stop off in Tam Coc where we got to explore an awesome temple surrounded by rock formations – giving us some amazing views of the Ninh Binh. As we were rather pushed for time after spending so much time in Hanoi, we swiftly made our way to Vinh where we spent the night before getting up early to get back on the road. I’ve been told that if you don’t visit Phong Nha in Vietnam then you haven’t truly experienced Vietnam at all. Boasting some of the biggest natural caves in the world, Phong Nha-Ke Bang National Park truly is a site to behold. According to the Lonely Planet, the mountains in the park are oldest in Asia, formed approximately 400 million years ago. Some of the most popular choices of caves to visit include Paradise Cave and Dark Cave. Dark Cave costs around 450,000 dong for all the activities, including the zip-line and mud bath, while Paradise Cave only costs 250,000. After speaking to the one of the staff members at our hostel, we opted to just pay for the Paradise Cave as he assured us “You cannot say you’ve been to Phong Nha if you’ve not visited Paradise Cave,” and we were travelling on a budget after all. And the caves sure did not disappoint – they were huge! Unfortunately I didn’t take the best camera with me, so all the pictures I got of the caves did not do them justice. As we were waiting to enter the caves, we bumped into our friend from Hanoi who was travelling with someone else from the Netherlands. We invited them for a drink at our hostel Easy Tiger before we all headed to the only bar that was open late in Phong Nha. 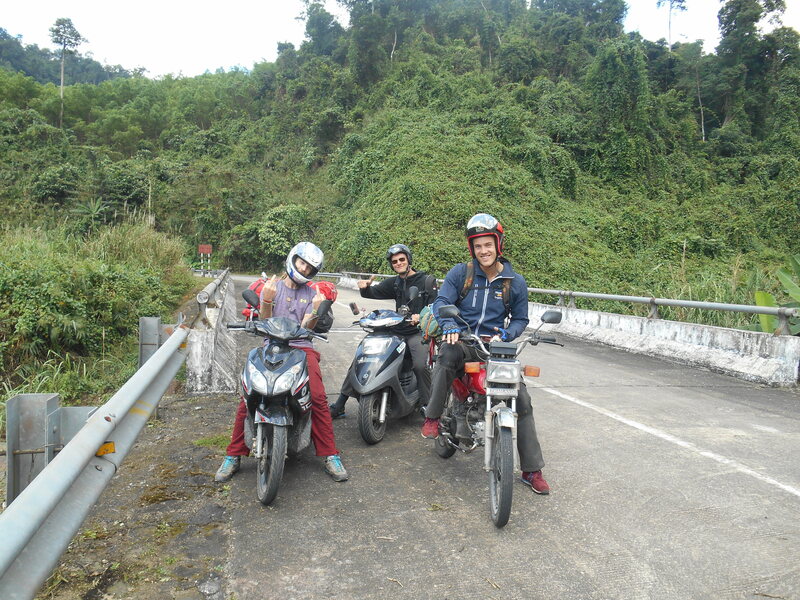 It turned out our friends had also bought motorbikes and were driving the Ho Chi Minh Trail, so we all left Phong Nha together and made our way towards Hue, stopping off in a small town called Khe Sanh on the way.